According to the Department of Education every child should be writing their names and simple sentences by the age of five and joining up their letters by seven. Fact is a whole third of a class from every primary school in the UK is leaving at aged 11 unable to do this. Melanie Harwood’s daughter was one of those 1 in 3. Her daughter’s inability to write her name cost her a place at primary school, so Harwood decided to do something about it. In the process she invented a method that teaches children the life-enabling skill of handwriting, which she currently delivers as after school clubs. In just seven weeks her Start-Bee handwriting method can get any child writing their names in a legible, neat, cursive script. Handwriting is a skill that is fundamental to unlocking an individual’s potential in life. Scientific evidence proves that children who can write are able to access the entire education curriculum more efficiently than children who cannot write. Even in a digital age, whilst computers are still barred from the exam room, children need to be able to write fluently and quickly if they are to pass exams. Now Melanie is turning her method it into handwriting kits and the accompanying lessons into films that will be broadcast over the Internet. The kits are being presold from 8th September to crowdfund enough money to realize that ambition. Everything a learner needs to master handwriting has been carefully selected to teach every child, including those with SEN and Dyslexia, how to write, to expand their vocabulary and to read whilst having fun learning. Packaged up in a specially designed Start-Bee Trunki, you’ll find items such as bespoke pencils, puzzles, posters, ink pads, light box, exercises, support materials, folders, paper and stencils. The kit works in conjunction with 310 exercises, which will be broadcast as 70, one-hour lessons over the Internet. 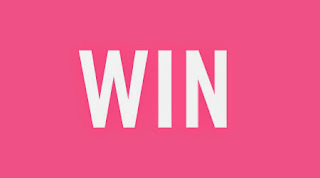 For your chance to win a Neutral Handwriter’s Kit (as seen above) complete with Trunki plus 4 lessons (worth approx £300 in total) you can enter via the Gleam entry form below. 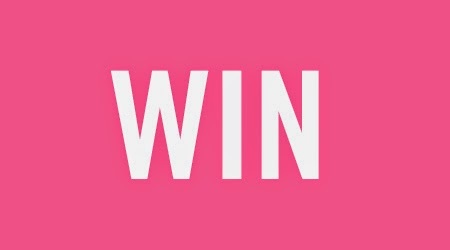 The giveaway ends at 11.59pm GMT on 1st October 2015. Please refer to the T&C in relation to dispatch times for this prize. I think the kit looks wonderful! I have been writing a journal since the beginning of the year. It may only be a paragraph or two a day but it has been helpful to note down my thoughts - it is the first year I have one this! I almost never write, but my son will be writing a few thank you cards soon for all the lovely birthday presents he's opened today. I've just started up a handwritten journal again and have missed doing it! My son is starting Reception next week, we have been practising writing his name together. The only thing I seem to write is shopping and 'to do' lists. I'd have some pretty stickers to help my writing look beautiful! I think the kit looks quite comprehensive and I'm sure she has thought out all of the contents from her experience of teaching the method. Perhaps what is missing would be some sort of reward sticker? I don't do a lot of writing these days. I think the last thing I wrote was a phone message. I recently wrote a massive to do list in my diary! I've been starting to write a book! I'm afraid recently all I have written is shopping lists. a rubber pencil gripper, to make it easier for little fingers to hold a pencil. I write to my little girl every day. I have been keeping a diary and update it every evening, it contains my thoughts, feeling and emotions. It is incredibly moving to look back on previous entries because they capture so many special memories and fleeting feelings. I write in my diary, daily! shopping lists, to-do lists, things i need to buy for my daughter when she arrives, moving house list. I have helped my daughter to make a scrapbook of our summer holiday, so I've been writing in that. I'm a huge to-do list writer! I've recently written a thank you note! The kit looks lovely! I write. Everyday in my recovery diary...its something I've been doing for the last ten years ..since I got into a twelve step programme and I find it helps me so much! Sadly, the latest thing I've written is 2 reports about inappropriate behaviour in my taxi! I have been keeping a diary with my boys of what we did on a day to day basis over the summer holidays. They have loved writing little paragraphs and drawing or taking accompanying pictures and sticking them in. It will be a lovely memento for them to look back at to remember a wonderful summer. Love writing with my daughter who has just started primary 1. It would be nice to include some fun tracing, mazes, and connect the dot activities to help develop the skills in another way. Lists!!!! I always write Lists! I once had a friend ask me why I didnt put my lists on my ipad or computer and I answered.. because I like writing! I wrote postcards whilst on holiday. I have written a section of the book "Of the River People: Memories of a Midland Childhood by Anthony Perry" published a few months ago. i have been writing shopping lists pretty boring i know! Some stripy bee border paper would be super. The only writing I seem to do is shopping/ to do lists! I wrote a letter to a friend, an actual letter, not an email! I used to write a lot of poems. Unfortunately I don't anymore. Perhaps if I did, my two sons would imitate me. They don't like to write at home and have bad handwriting. I've just moved house and have found myself writing endless lists of things I need to buy and things I need to fix! Myself and my two bubs aged 6 and 5 wrote to NASA, with some questions about space. It was a fun way to get them writing and we got a reply with stickers and pics of some real life astronauts! I have been writing my sons Christmas wish list! We found pencil grip aids a big help. My son refused to hold a pencil with his fingertips as he said it hurt his fingers. But with the help of rubber pencil grip aids we managed to work through it. I wrote a note to the teacher to let them know my son's reading record wasn't in his homework bag but we had completed the reading book and discussed the story. 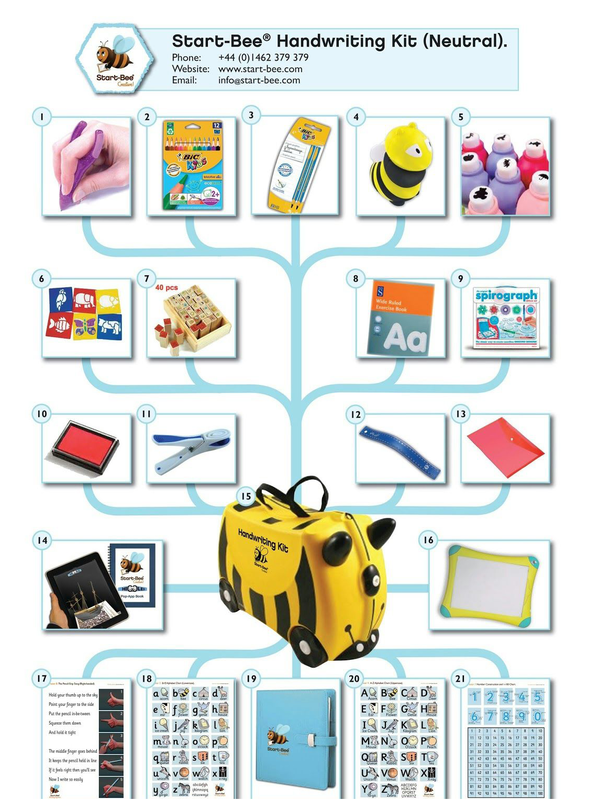 The bumblebee Trunki to keep all of the amazing learning tools in. I would like to see a sheet showing how kiddies should be forming their letters correctly. Where the pen should start and finish. Perhaps add a hotter/notebook for drawing pictures and writing a story about it, next to or underneath. I used to love creative writing as a child/teenager but sadly the most I get to write these days is the shopping list! I have been writing a little piece about how wonderful old cats are for a charity. we love writing stories together. We take turns to write parts. I've encouraged son to write the sort of fantasy stories he enjoys with pictures. I write lists every single day and cross out things as i do them. I do very little writing now, I struggled with it as a youngster and had to have lessons. My 7 year old son is having the exact same problems as me so most of the writing I do is for him to copy! The kit looks great, perhaps some grips would be a good addition?